Posted on 17th March 2014 | Comments Off on FINE TUNE WRIST LANYARDS FOR MAXIMUM WORKSITE SAFETY, INCREASED PRODUCTIVITY AND EASE OF USE. Gear Keeper’s new retractable and non-retractable wrist lanyard systems for tools up to 2.5 Kg. are particularly valuable when a short drop length is critical or when climbing or working in close quarters. Productivity is increased by the company’s patented Quick Q/C and Q/C-II Connect tool attachment connectors that permit secure, fast and easy connection / disconnection of tools. Users can change out and use many tools with just one lanyard by fitting additional male connectors to all tools being used and merely unclick one tool and attach another. The modularity of Gear Keeper tethering system offers the flexibility needed to safely and specifically match the tool, worker and application. Unlike an ‘off-the-shelf’ lanyard, which can actually become a safety hazard, all Gear Keeper tethering systems insure dependable safety and quality by the company’s stringent quality control systems. QA includes dynamic and static testing, drop load testing with up to a 100% safety margin and cycle testing for safe productive use and long-life. Two Gear Keeper wrist lanyards that are among the popular choices of safety engineers are the model TL1-2006 Retractable Wrist Lanyard for tools up to 0,5 Kg and the non-retractable model #TL1-2007 Deluxe Wrist Lanyard for tools up to 2,5 Kg. 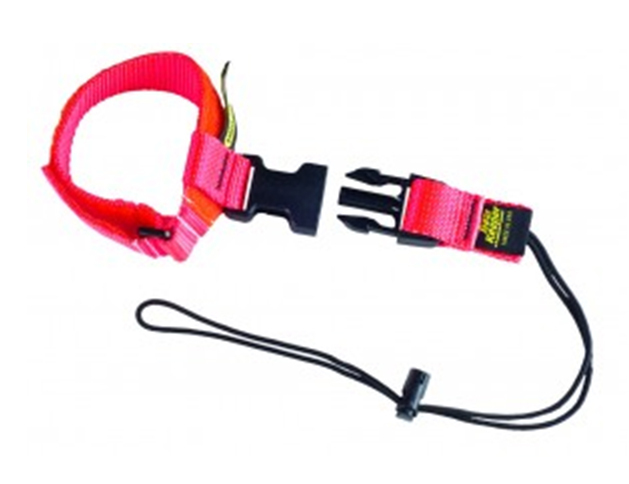 Both types offer Velcro wrist straps and are available in high visibility safety orange with serial numbers to satisfy traceability standards. The TL1-2006 Retractable Wrist Tether offers a 100cm extension and comes complete with the model #ACO-0926 Q/C II Elastic Lanyard Connector. Suggested retail for the TL1-2006 Retractable Wrist Lanyard is € 32,49. Additional connector accessories include a 7,5 cm Load Bearing Aluminum Carabiner model #3-0069-03 – € 2,79, and extra male Q/C II elastic lanyard connectors model #ACO-0926 are € 4,99 each. The TL1-2007 Deluxe Wrist Lanyard (non-retractable) comes complete with the model #ACO-0206 a 33 cm Nylon Lanyard connector. Suggested retail for the TL1-2007 Deluxe Wrist Lanyard is € 16,49. Accessories include a 7,5 cm Load Bearing Aluminum Carabiner model #3-0069-03 – € 2,79, and 15 cm and 33 cm lanyard nylon connectors for € 4,99 (15 cm reach) and € 5,99 (33 cm reach). This entry was posted in GearKeeper and tagged avera, avera distributing, Gear Keeper, gearkeeper, TL1-2006, TL1-2007. Bookmark the permalink.